A Colorado man went for a trail run on Monday (Jan. 4) and it turned into a harrowing experience. While running on the West Ridge Trail at Horsetooth Mountain Open Space in Fort Collins, the man heard something behind him. When he went to turn around, a mountain lion attacked him, biting his face and his wrist. Fox31 Denver reports that he had puncture wounds on his arms, legs, and back. 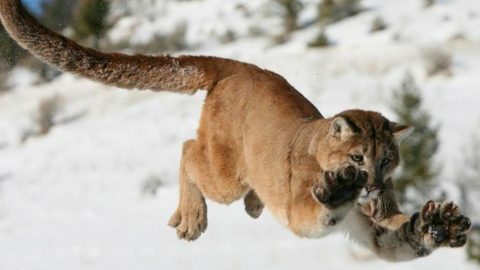 Somehow, he managed to break free to defend himself, fight back, and ultimately suffocated the mountain lion with his bare hands. The man, who hasn’t been named in the media, was able to walk back to his car and drive himself to the hospital. Experts say the cat was a juvenile mountain lion, which probably gave the man an advantage when fighting back. The mountain lion was recovered and taken to a lab for tests, where it tested negative for rabies. Because of this incident, and additional mountain lion sightings, Horsetooth Mountain Open Space will be closed and the situation will be reassessed on Friday, February 8.